Spectacular peak fall foliage, sky rides, live music by Amanda Lee Peers, currently on The Voice, festival vendors, kid’s activities and the amazing Scottish Highland Games will make for an exciting Fall Festival at Bristol Mountain on Sunday, October 12th from 10am-5pm. 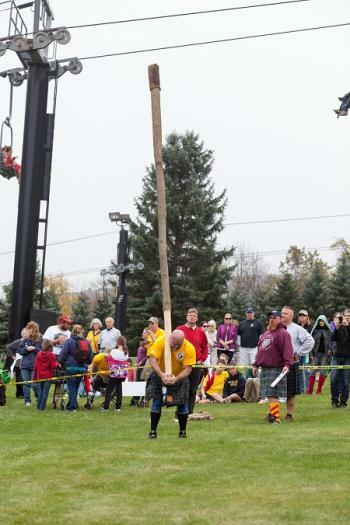 Guests can watch over 30 kilts clad US and Canadian athletes compete in a variety of events which includes: Open Stone, Hammer Throw, Sheaf Toss, Caber Toss, Caber Toss, Weight over Bar and Weight for Distance. Spectators will have the opportunity to make a donation to OASIS (Outdoor Adventures for Sacrifice in Service) by participating in the Keg Throw. All sponsorship dollars will support the mission of OASIS, which is to teach disabled military veteran to ski on adapted equipment as well as participate in archery, sailing and horseback riding. Crowds of 6,000 or more are anticipated based on previous years’ attendance. Rochester singer, Amanda Lee Peers, who is currently on Team Gwen on the music reality show The Voice, will perform from 12pm-3pm outside the Rocket Lodge. For the first time in the history of the Fall Festival, entertainment has been added at the Summit of the mountain. Guest exiting the sky rides will be treated to the sounds of the Honey Smugglers and Double Funk Diamond, who will perform throughout the afternoon outside of the Summit Center. The base area of the mountain will be the backdrop for a variety of vendors including Hemlock Hills Alpaca Farm with a few alpacas to show, a quaint farmer market provided by Shimmering Light Farms, Café Sol, Simply Crepes, The Brown Hound Bistro, and Santillo’s Fried Candy Bars. Food trucks include: The Original Mac & Cheese Food Truck, Smoothies Plus and Dar’s Delights Ice Cream. Other food options include Carver’s Kitchen, the Summit Grille and the Morning Star Café (homemade Belgian Waffles) our mid-mountain cafe. A variety of local wineries, breweries and distilleries will provide tasting opportunities for age appropriate guests. They will include: Black Button Distillery will sample their unique Bourbon infused maple syrup, Arbor Hill Winery, Raymor Estates Winery, Casa Larga Winery, Naked Dove Brewery, and Genesee Brew House. Face painting, arts and crafts, and the Ontario Country Safe Child ID program will be available in the Rocket Lodge. Local craft vendors will also be on hand. Families can even enjoy volleyball with a 48” beach ball. If conditions are just right members from the Rochester Area Flyers Hang Gliding Club may take flight off of Stid Hill. Scottish Highland Games organizer Tim Mullally is thrilled to be back for the second year and has more athletes than last year committed to compete. As is the tradition of these games, a Scottish Bag Pipe troop from Rochester, will pay tribute to fallen soldiers with bag pipe program from 11am-11:30am. In preparation for the upcoming ski and snowboard season Bristol Mountain will be hosting a Used Ski and Snowboard sale in the Event Center. For more information regarding the Bristol Mountain Fall Festival, Fall Sky Rides and the Scottish Highland Games please contact Drew Broderick at 585-455-4186 or dbroderick@bristolmt.com. For Fall Sky Ride information please go to http://bristolmountain.com/fall-sky-ridesSpectacular peak fall foliage, sky rides, live music by Amanda Lee Peers, currently on The Voice, festival vendors, kid’s activities and the amazing Scottish Highland Games will make for an exciting Fall Festival at Bristol Mountain on Sunday, October 12th from 10am-5pm.